Attilio Pratella (born 1856 in Lugo di Romagna, Italy; died 1949 in Naples, Italy) was an Italian painter. Pratella studied at the Accademia di Belle Arti in Bologna. He won a scholarship, so he went to Naples to study at the Accademia di Belle Arti di Napoli, where he spent the rest of his life. 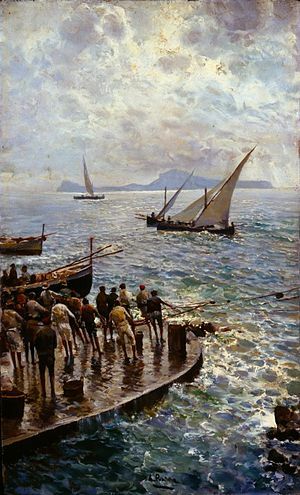 His favourite subjects were Naples with its markets and animated waterfronts, along with the neighbouring hills of Vomero, the island of Capri and the coastline of Sorrento. Pratella's sons Fausto and Paolo, and his daughter Ada were also painters. His works are exhibited in the main public Italian Modern Art Galleries of Milan, Naples, and Rome. After Pratella's death, a street in Naples and in Lugo di Romagna was named after him.